My mum gave me this plant, grown from a cutting. She called it "femöringsplantan", which basically means penny-plant (a 5 öre piece is a low value coin). It's one of those popular names that attaches itself to lots of different plants. Perhaps it's most commonly used for another group of popular house-plants, Achimenes species (Widow's Tears, Cupid's Tears). 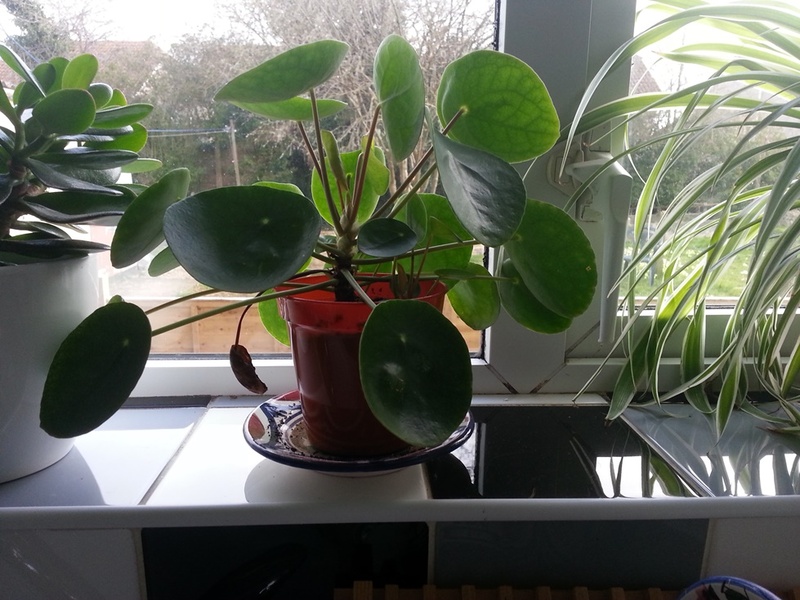 But this plant, it turns out, is Pilea peperomioides, most commonly known in English as the Chinese Money Plant. Other common names in Sweden are Elefantöra (Elephant's Ear), Missionärsplantan (Missionary Plant) and Parasollpilia (Parasol Pilea). It has a remarkable history in the west; I'll give a summary version, but the link is better reading. George Forrest collected the plant for the first time in 1906 in Western Yunnan, and his material ended up in Edinburgh, but the species remained poorly known in the west. From the mid-1970s members of the general public started to bring it in to Botanical gardens in the UK asking for identification, but the experts found it difficult to identify because the plant rarely produces flowers in the west, especially female ones. On the other hand the plant was very easy to propagate, so it was widely distributed by plant-lovers and became quite well-known among indoor gardeners even though scientists didn't really know what it was. Like all subsequent owners, he gave away many cuttings to friends and relatives. So that's where it all began. My own plant, like all others in northern Europe, derives ultimately from Espegren's plant. A rather touching story in which commerce, for once, plays no part! Ulrika Olsson's account, in Swedish.